There are no Events to display in this category. Tue., Nov. 12, 2013 11:30AM - 12:30PM CST Live Mike's Mid-Week Chat Join Packers.com's Mike Spofford as he answers fan questions about the team and the latest happenings in his weekly chat. Inevitably, procedures at Packers games have come a long way since 1919-20, when the team subsisted on the contents of George Calhoun's hat. At that time, there were no ushers, cheerleaders, band or public address system, which hadn't yet been invented. There weren't even any seats, and admission was free. From 1919-56, the Packers played their Green Bay games -- including their first league contest -- at virtually the same address. Their first home games were at Hagemeister Park, a vacant lot marked with a football gridiron, adjacent to East High. There were no gates because there wasn't a fence. Spectators just dropped off the Walnut Street trolley and walked to the sideline, or drove their own cars and parked about 10 yards behind the ropes stretched around the playing field. If they felt like it, they either sat in their automobiles or on top of them, but most preferred to get out and follow up and down the field. By moving as play progressed, one always had a "50-yard line" location and was handy for any donnybrook that might require a little help. In fact, when things got exciting, the crowd sometimes spilled right onto the field, surrounded the scrimmage in a big circle and virtually took part in every play. Teams didn't huddle in those days, or the fans would have been in that, too. When the half ended, teams grabbed blankets and adjourned to opposite end zones where they relaxed and talked over the tactics of the next half. The crowd formed a ring around the players, a practice encouraged since it made a handy wind break. Fans weren't bashful about joining the discussions either, sometimes with surprising results. At least one early game was pulled out of the fire by a spectator's halftime suggestion. In 1920, the city built a section of stands -- a small bleacher that held about 200 -- giving the Packers their first justification for charging admission. The next year, a portable canvas fence was erected around the perimeter and a regular admission charge inaugurated. When Hagemeister was dug up in 1923 to make way for a new East High School, the Packers shifted to the new baseball grounds at the end of Main Street, Bellevue Park. Crowds of 4,000-5,000 stormed the fences to boo the hated Chicago Bears. Green Bay was 9-2-1 in 12 league games at Bellevue from 1923-24. Eight of the nine Packer wins were shutouts, and the team won its last seven at the stadium, including a 5-0 home slate in '24. The lone tie was a scoreless affair in 1923. After World War II, City Stadium gradually faded from its once proud position as one of the favored fields in the National Football League, to an inadequate and obsolete installation. As pro crowds increased, it was impossible to expand the stadium any further. With limited capacity, the Packers found it increasingly difficult to schedule top opponents at home. On Nov. 18, 1956, the Packers lost their final game at the stadium, to the 49ers. A new City Stadium, on Green Bay's west side, opened the following year (renamed Lambeau Field in 1965). The decision to play games in Milwaukee (including State Fair Park and County Stadium) played a key role in the Packers' survival. It allowed the team to tap a larger market and thwart any efforts to establish another competing pro football team there. The Packers played games in Milwaukee for 62 straight years (1933-94) until opting -- mostly for financial reasons -- to move all games to Green Bay beginning with the 1995 season. Hagemeister Park, 1919-22... Classic sandlot, near Baird and Walnut streets, adjacent to East River... East High School now occupies land. Bellevue Park, 1923-24... Minor league baseball park, near Hagemeister Brewery, in 100-200 block of North Main Street. City Stadium,1925-56... Located behind East High School... Expanded several times to reach peak capacity of 24,500... Annually voted the NFL's best playing surface, because it sat just yards from the East River... EHS football team still uses downsized facility. Borchert Field, 1933... Hosted one game... Minor league baseball park, home to NFL's Badgers from 1922-26... Located near Burleigh, Chambers and North Eighth streets... Torn down in 1954, it's now a children's playground. State Fair Park, 1934-51... Location: West Allis, Wis., near West Kearney, Greenfield, South 77th and South 84th streets, on Wisconsin State Fairgrounds. 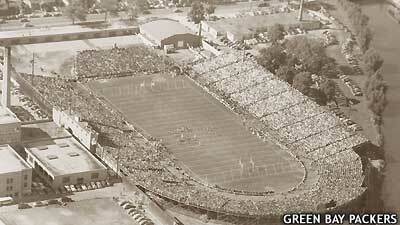 Marquette Stadium, 1952... Also housed Marquette football team. 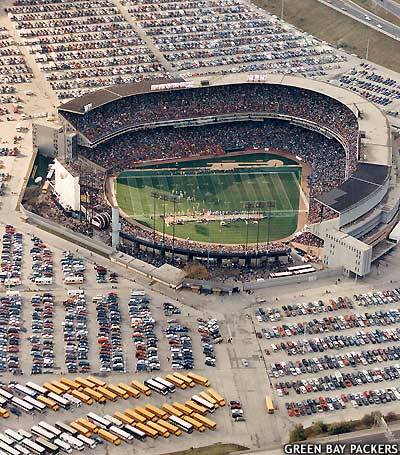 County Stadium, 1953-94... Home to baseball's Milwaukee Braves and Brewers... Off Interstate 94... Both benches were on east sideline... End zones ran north-south, from third base to right field... Demolished in 2000 to make parking lot for Miller Park. Copyright © 2013 Green Bay Packers, Inc.